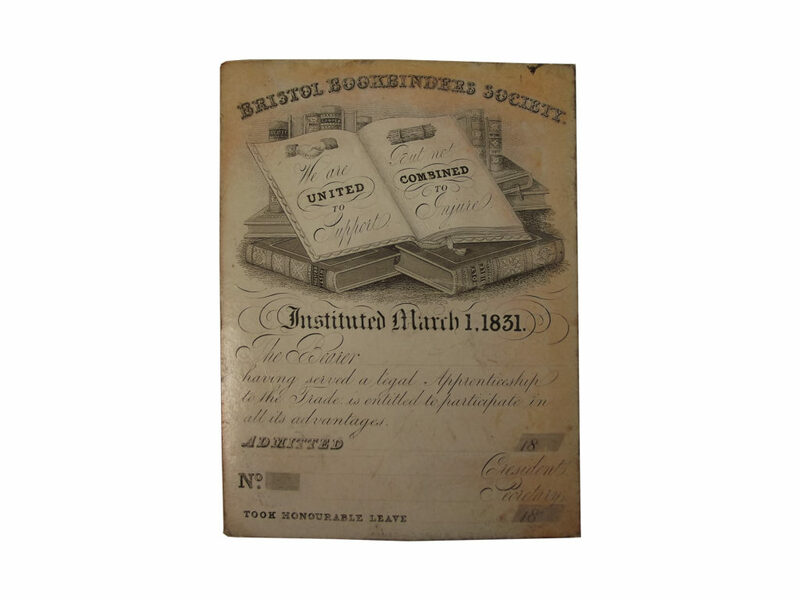 A recent acquisition for the biblio-ephemera collection here at ZHQ, an attractively engraved trade union card for the Bristol Bookbinders Society. The card has not been filled out, but notes that the bearer ‘having served a legal Apprenticeship to the Trade is entitled to participate in all its advantages’. The Union was formed in March 1831, and their motto was ‘We are United to Support, But not Combined to Injure’. The Historical Directory of Trade Unions – Volume Five, notes that the rules “drawn up in that year are still available, but no subsequent information has been found”. The Jaffray collection in the BL, (Jaffray was himself a bookbinder and interested in the history of his trade and particularly trade union and welfare issues) holds a document noting the cash amount held for the Society ending March 1833 (probably just the year ending for the Society rather than the end of its existence), so we know it lasted until at least 1833, but I haven’t been able to find out anything further about it. Howe refers to Jaffray’s collection in his A List of London Bookbinders 1648-1815, but Jaffray himself does not appear in Packer’s Bookbinders of Victorian London, so he probably always worked for other bookbinders. An invitation / ticket for the (first?) anniversary dinner of the Associated Bookbinders of Chester, June 28, 1828, with a wonderful typographic border. 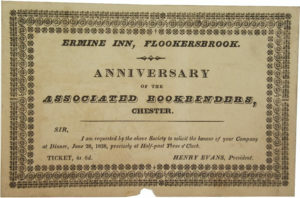 It was held at the Ermine Inn, in Flookersbrook. Henry Evans was the President of the Associated Bookbinders, he appears in an 1826 Poll Book as a bookbinder in Linen-Hall Street, Chester, but doesn’t appear in the Pigot’s Commercial Directory under Bookbinders for 1828-9 (there are six other bookbinders listed in Chester). It appears to have been clipped to the centre of the bottom edge, so was presumably used by the bearer to attend, the dinner cost 4s 6d.